Nepal a beautiful mountainous country, having the Mt. Everest on its head has several other natural beauty. 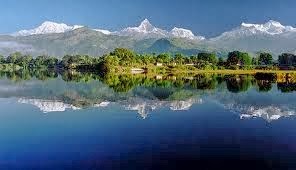 Pokhara is the second big city and also known as tourist capital of Nepal. It has lakes and Machhapuchhre range of inner Himalaya in landscape. It is in middle part of country having its elevation about 1000 m. Geology of pokhara valley is quite different, Pokhara Formation is mainly a debris flow deposits. It is slightly to moderately cemented silty and sandy gravel with main constituents of limestone, schist, gneiss and granite. Generally thickness is highly variable up to 80 m thick with up to 2 m soil cover. Karst structures are occasionally present. Wide variation in bearing capacity has risk of underground karstification. There are many caves with in its heart with flowing seti river like hide and seek. Now, Armala V.D.C. 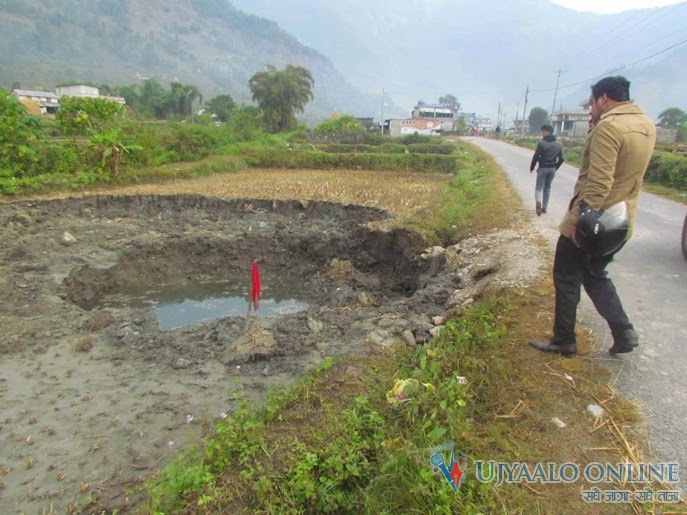 near Pokhara facing the problem of sinking the ground in numerous and continuous since 12th of November 2013. 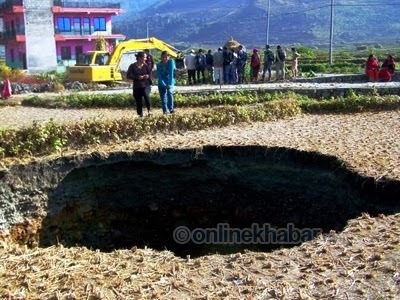 For Pokhara valley and its surrounding, due to geological structures researchers already specified about risk of sink holes but its not exactly specified on this area where it appears now in NG/UNDP Report of Earthquake Vulnerability Profile and Preparedness Plan, which mainly focus on earthquake risk and hazards. beds, or deposits that can naturally be dissolved by circulating groundwater. As the rock or semi-consolidated deposit dissolves, spaces and caverns develop underground. 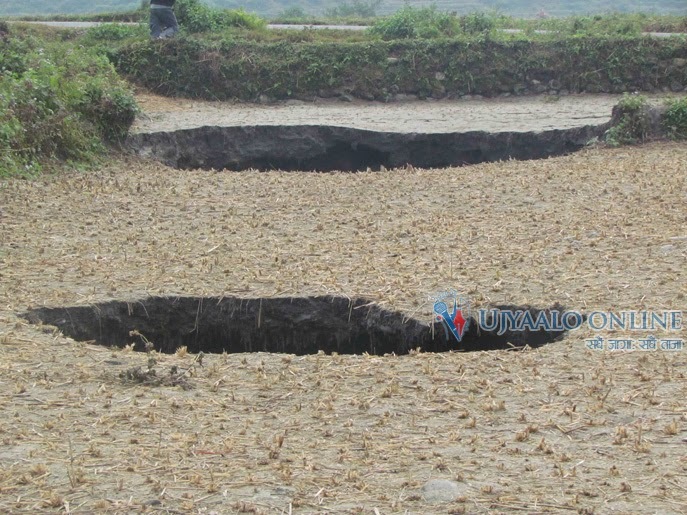 Because of such sinkholes, a sudden collapse of the land surface can occur. 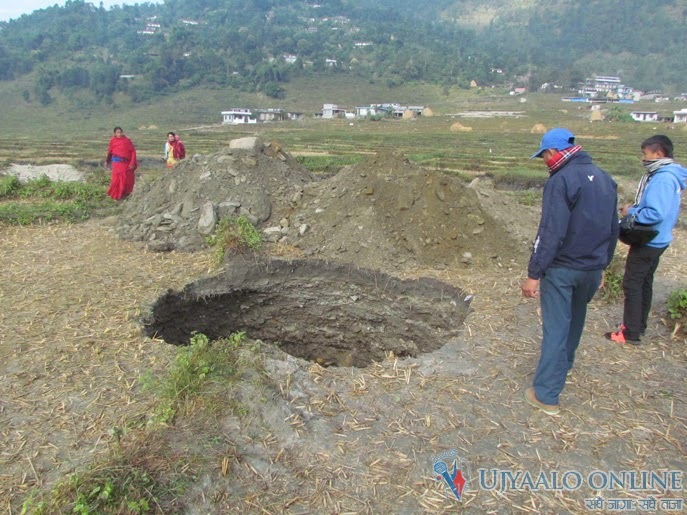 During an earthquake, land collapses are likely to occur because the land surface cannot bear the substantial load without adequate underground support. 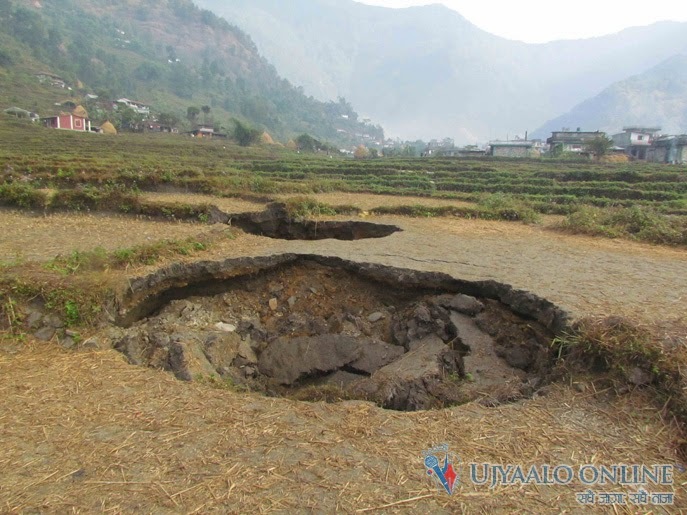 Therefore, the land collapse is another major hazard in urban areas during an earthquake is observed. 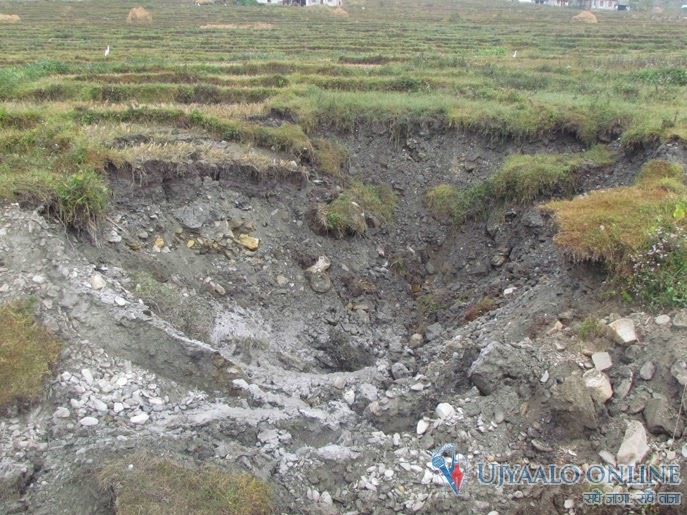 On June 2, 2010 Guatemala city had already faced same type of sinkhole left one people dead, which was formed in city centre like manhole for sewer line and also more frequently on the country throughout the time, but mostly single hole noticed. Similarly US, China, Jordan Oman had also faced such disaster. They had mostly a single sinkhole but here in this case already 45 holes formed. Especially it occurs when large earthquake triggered or heavy precipitation for long time etc. but now that area did not felt like those events. Just sinking like big potholes having depth about 5 and more meters. Those are mostly in farm land and some holes formed in residential houses. Most of houses among 51 in this area are now relocated to a safe place. There is a small stream kali khola which may have some contribution to this disaster but not finding the exact cause and solution yet. 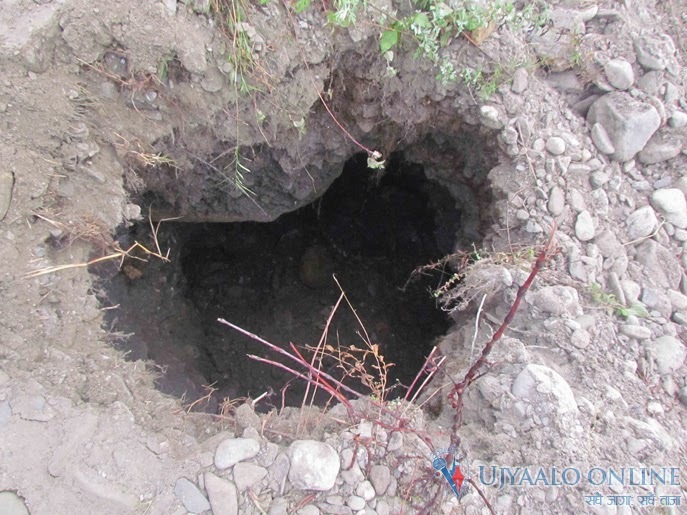 Local government just try to fill those holes by soil from outside but its not a solution. This location from google and video from YouTube can help you to visualize. This became an interesting point of geological research. Have you feel in you area like such problem? You can share your views.